Note the green carpet, sadly there was no hardwood under the dining room. The wallpaper has seen better days, considering you can see the outline of where all the previous artwork hung. I miss my red dining room, and will almost a full gallon on paint left, it will some make a comeback! Here is the dining room today... sadly it looks pretty much exactly as it did the day we moved in. The carpet is on its way out. We bought some Allure Flooring from Home Depot with a slate tile pattern. It's not going to be a forever fix, but its not carpet, and does not hold allergens and its an easy clean. The wall paper will come down at some point and above the chair rail will be red. The bottom of the chair rail needs a fresh coat of white. 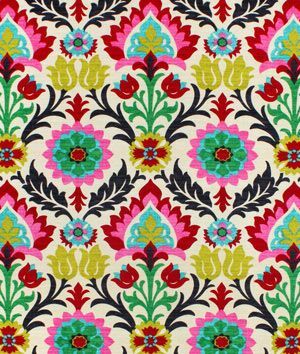 I was looking for a bold pattern for some new curtains, I found this great Waverly print that will make some great curtain panels. 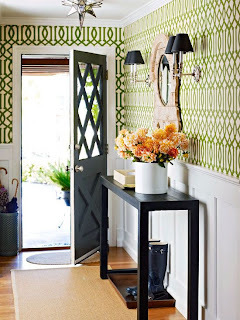 It will also tie into the future foyer plans, I plan on pulling in the green from the pattern to the foyer. Recognize the pattern? Well I still have the stencil, so what's a few more accent walls.